Look up at the sky on a clear night, and you'll see lots of stars. Sometimes they seem almost within reach or at least a short rocket ride. But the closest star to Earth—not counting our sun—is more than four light years away, at a distance of 25 trillion miles. There are more than 100 billion stars in our Milky Way Galaxy, and, while we have learned much about them, there are relatively few whose size has been directly measured because they are so far away. A star's size is a key piece of information that unlocks many other mysteries about it. Several methods have been used to measure star sizes, yet each has its limitations. 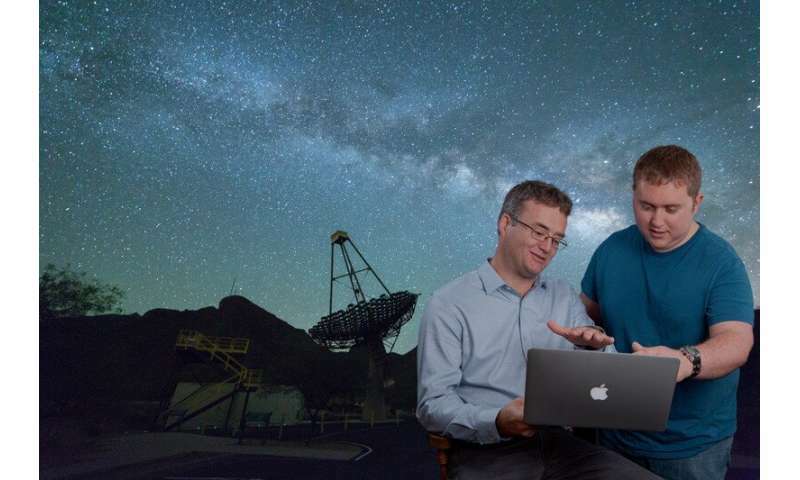 "Knowing the size of a star is of overall importance," said Jamie Holder, associate professor in UD's Department of Physics and Astronomy and a co-author of the study. "How big and how hot a star is tells you how it was born, how long it will shine, and how it will eventually die." "You just can't resolve the point-like image of a star," Holder said. "It will look fuzzy through your telescope." To overcome this limitation, scientists use an optical phenomenon called diffraction to measure a star's diameter. When an object passes in front of a star, an event called an "occultation," the shadow and surrounding pattern of light waves can be used to calculate the star's size. 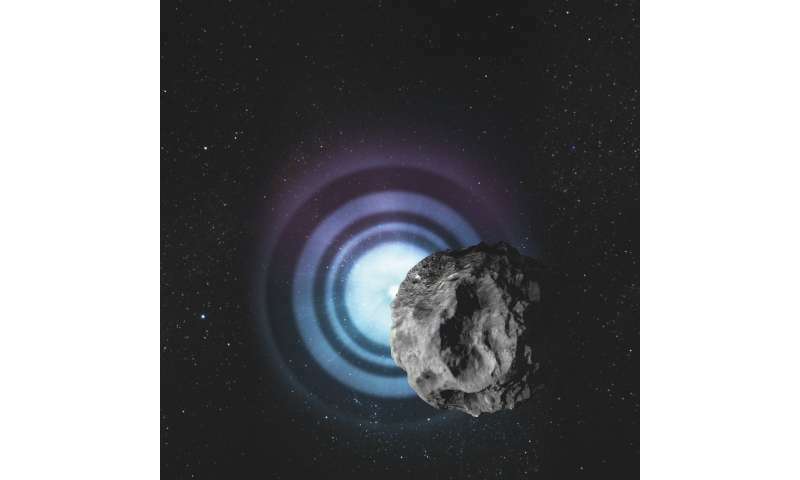 Asteroids travel at an average speed of 15 miles per second, which added to the team's challenge. Normally, the VERITAS telescopes watch for the faint bluish blip that high-energy cosmic particles and gamma rays produce when they race through Earth's atmosphere. While the telescopes do not produce the best optical images, they are extremely sensitive to fast variations of light, including starlight, thanks to their huge mirrored surface, segmented in hexagons like a fly's eye. Holder was involved in the construction and commissioning of the telescopes in 2006, and all of the light sensor modules for the four telescopes were assembled at UD. "Nobody was sure the occultation would even be visible from our location in the first place," he said. "The most recent estimate we had going into the night was that there was about a 50 percent chance that the shadow would be cast over our observatory—the asteroid is small, and there were uncertainties in size and trajectory, making it impossible to say for sure where the shadow would fall." The VERITAS telescopes allowed the team to take 300 snapshots every second. From these data, the brightness profile of the diffraction pattern could be reconstructed with high accuracy, resulting in an angular, or apparent, diameter of the star of 0.125 milliarcseconds. Together with its distance of 2,674 light-years, the scientists determined that the star's true diameter is 11 times that of our sun, categorizing it as a red giant star. According to Holder, this star is about 200 million times farther away from us than the sun, but it's still well within our Milky Way Galaxy, which is 100,000 light years across. Many or most of those Stars that we see NOW aren't even in those same locations anymore. They have moved closer or farther away or just out of our "line of sight" and they will never be seen in their true location at the moment we are seeing them in our 'scopes. Where each Star is actually located at the given moment that we are looking at them, that location will not be revealed to us for, perhaps, a million Earth years or so. And by the time that THAT image comes to us, the Star or Stars had moved on already. So, in truth, we would have to be right in their vicinity or less than a lightyear away to be able to see their exact location without their having moved on already.